Ontdek Kenya (meaning 'discover Kenya' in Dutch), was founded in 1996 and is a Kenya tour operator specialized in walking vacations, bird watching holidays, photo safaris and unique wildlife safaris offered in small groups or as private departures. Check our 'Activities' from the drop-down menu. Based on the number of clients per year, we are not a big Kenya tour operator and this is how we wish to be, as our focus is to serve a niche of the discerning nature travelers on a very personal level rather than run convoys of safari buses. We are convinced that we are meeting and exceeding our clients' expectations as several of them have been repeat guests and sent many referrals to us. We are also extremely honored with the many positive safari reviews that our past clients have posted on the Internet. Meet Peter Huysman and see how we work. We look forward to hosting you on safari in Kenya. 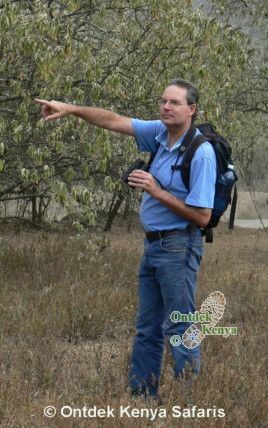 Kindly contact Ontdek Kenya Safaris.